Happy Sunday! I hope everyone had a lovely Valentine's Day. Today I have a brand of naughty named nail polishes to show you from NailMe! While browsing through a list of indie nail polish shops, I stumbled upon this brand, and let me tell you, the names are absolutely HILARIOUS. This is the first time I've ever bought nail polish based on name, and not color. I picked 3 of my favorites. Berry It Deep is a beautiful purple shimmer. No issues with formula or application. This is 2 coats topped with Out the Door. 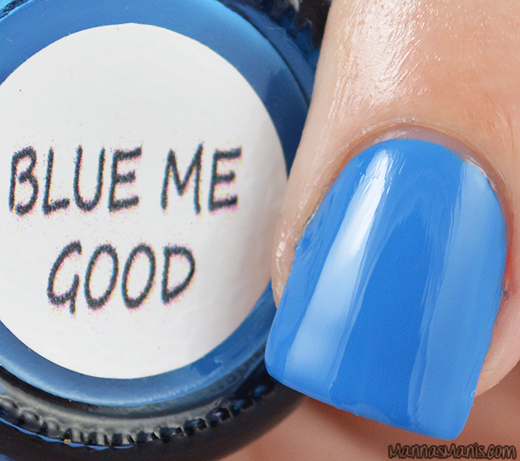 Blue Me Good is a beautiful bright blue creme. No issues with formula or application. This is 2 coats topped with Out the Door. Spank my Ash is a gray matte. I'm not big on mattes, or grays, but cmon..that name! This is 2 coats, no top coat. You can find these and the rest of their naughty collection HERE for $4 each!